What is a Thermal Performance assessment. A Thermal Performance assessment gives a quantified measure of heating and cooling energy loads for a paarticular dwelling. The assessment is done by inputting building design details into a computer programme. The heating and cooling loads are needed in the Thermal Comfort section of BASIX. 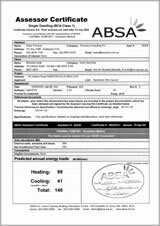 Typical documents consist of a stamped Thermal Specification on a nominated sheet of a set of plans and the ABSA assessor certificate. Sample of a stamped Thermal Specification on a nominated plan. Contact office and get a fee proposal. Send plans by fax or email for quick reply. Email plans can be read in various formats including PDF. The assessment will be done and a report on the interim results will be sent. We then work with you to get the best results possible. ** Note: A deposit payment is required to do the assessment. Balance on completion. A tax invoice which outlines easy payment options including credit card and BPay will be sent if fee proposal is accepted. Site plan, floor plans, elevations and sections scaled(1:100) and dimensioned. Plan sheets numbered. Window type ( eg timber), size and position. The time to do an assessement varies depending on the complexity of the design. Please contact the office for a fee proposal for any residential development, including multi-residential developments. You can fax or email plans to the office for a quote. 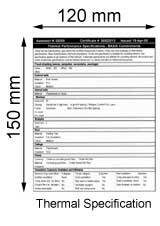 Faxed plans will typicaly not be to scale but that is OK to do a fee proposal. 6 easy steps to a Thermal Performance assessment. Preliminary planning consultation can save money. A well designed house will achieve minimum heating and cooling loads, making it easier to pass the Energy section of BASIX. 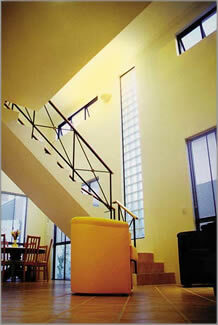 The house is more comfortable in summer and winter and you save money in running costs. Seeking our advice before the plans are finalised may save changing the plans or having to commit to more expensive BASIX commitments. More information (links) on good design.